More so than ever, businesses have woken up to the importance of design to solve complex business challenges. It’s a vehicle by which brands can express themselves across a complex range of mediums. It is the means by which companies build emotional connections and stay on the leading edge of change. In 2015, the UK design economy generated £71.7bn in gross value added (GVA) to the UK alone, that’s equivalent to 7.2 percent of total GVA according to the Design Council. A professional, quality design lasts longer and will improve over time – that’s a fact. You only need to mention Coca-Cola and you can visualise their hand-lettered logotype on a red backdrop – or Innocent’s friendly, simple logo and honest, upfront branding. Each one conjures up different emotions based on your own or shared experiences with their brand designs. Why are these brands so well recognised now more than ever before? Because they have been carefully crafted and refined. And creates a solid foundation over time. I’ve spoken to and come across a variety of start-ups and small businesses over the years – and some have launched a product or service without investing much time into creating a professional brand design. We’re living in a new, fast-paced, internet age where the current trend is to launch your product or service quickly and cheaply and refine it as you go, rather than creating a slick brand that never sees the light of day. 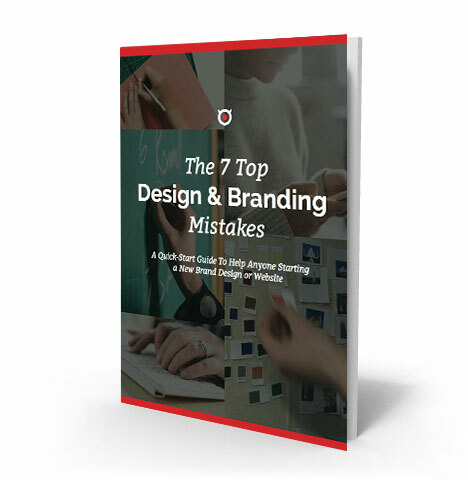 Below I’ve put together what I found are the most common design and branding mistakes businesses make in the hope that you can avoid them and be well prepared when creating your brand design. Sign up and download your FREE guide by email – as well as keeping you informed of the latest tips and advice on how to build a business brand and website. First impressions last and the way your brand comes across will define who and what you are in an instant. Get it wrong first time and you’ll struggle to regain that trust back and your customers will look elsewhere. Crafting a cohesive well-planned brand roadmap and strategy helps you and your team better understand who you are and why you matter – It explores current pain points and the context of what’s happening within your company, your industry, competitors, and who your customers are. Once these are clarified and put down on paper, it provides a solid base of reference to guide your branding. This helps ensure your visual graphics, logo, website design – as well as your messaging, advertising, social media, customer support, and any other customer-branded interactions remain positive and on target when first experiencing your brand. As your business brand and website grows and ages over time, it’s not uncommon for its style to change and evolve. This can happen when you’re working with different designers with their unique design styles – or when creating your own designs. Having a brand that is consistent and looks the same across all your marketing activities makes it easier for customers to know and trust you. It’s also the same for your website. In a UI (user interface), design consistency is one of the most powerful usability principles. It helps keep your users on your site for longer. This list isn’t comprehensive and can be adapted to fit your industry or business. If there’s some other elements to your brand that will help define your business, add them to your brand guidelines. Without them, you and your teams branding efforts will lack the consistency and direction needed across all your marketing activities. Read more: What Are Brand Guidelines And Why Do I Need Them? The savvy startup or small business who sets up all on their own has to think where to spend their funds to get the best value. They often resort to trying to do everything themselves, and that includes design. We live in an amazing world where anyone can make the jump from beginner to intermediate and create eye-catching graphics, images, and websites. There are many tools and resources that can help you, such as WordPress – for websites, Wave – for accounting, Canva – for graphics and more. But with so many great online tools available, it’s easy to try to do everything ourselves rather than working on your business. I know, it can be hard to delegate as a small business owner. Yes, it’s fine to take on those simple design projects that you can handle yourself – like blog pics, stock image design, and simple graphics. But when it comes to larger campaigns or projects that are going to have a dramatic impact on how your brand is received, I’d advise seeking professional design assistance. Your logo identity, website user interface, print materials, advertising campaigns, and any other brand materials are all important enough to signal an investment in professional design. All these elements will create an ongoing perception in the mind of your customers — and win their trust. Logo competitions or ‘crowdsourcing’ websites make their profit off people who work for free. So when it comes to getting a quick or cheap logo design online for your business brand you should expect the outcome will tend to generate poor quality. When it comes to something as prominent as your logo and brand image, it’s never a good idea to risk your business’s future with something you invested little in. These services may seem professional and easy to use but when you start using it for your business brand and website, you may find that you might not own the full copyright. And if you want to update or tweak the design in the future, there may be restrictions on what you can do. I’ve seen this happen first-hand with many startup clients. Designing a bespoke logo is more than just a working up a pretty graphic or icon in Adobe Illustrator. The process takes time and involves both you, and the designer really understanding your target market, your brand message, your business goals, and even your personality. It takes building these in parallel with your logo identity to ensure it has the lasting impact and quality needed to stand the test of time. Read More: How much does a logo design cost? You may have heard stories of people hiring their nephew or simply because they ‘knew how to use Photoshop or WordPress.’ In any profession, it’s always possible to hire someone you later find out just isn’t fit for the job. Getting your web developer or sales director to design your logo and brand identity may seem trivial to you – but hiring someone who is an expert in their field can make all the difference when it comes to delivering a consistent and clear brand. If you’re looking to invest in a good logo identity for your brand, it’s a good idea to take a comprehensive look at any designer’s portfolio, case studies and client testimonials. Ensure they have the experience required to blend strategy and content with stunning design to deliver you a final product that wows – engaging the right customer segments to grow your sales. Everyone has their opinions and tastes and will want to put their mark on a creative project. You’re the one paying and who’s the expert in your business. But some business owners will want to maintain complete control over the outcome of a brand design we provide. Things can start to go wrong when we start getting emotionally involved with our personal likes and tastes. We lose track of the end goal. To attract your ideal audience or customer. That’s not to say your tastes and personality should be completely removed from the design process, but they should be carefully considered to what’s best for your brand and for your customer. It’s always recommended – nay essential – to build the foundation of your brand and platform on something you own, rather than someone else’s. Social media provides a fantastic opportunity to reach more people than previously possible. On the downside though is the fact that these channels are outside of your control. Say you built up a following of 20,000 people who have an interest in what you do, and over the years who referred you a majority of your business? Then one day you wake up to find they’ve all gone? Creating your own self-hosted website and growing your email subscribers are the most important things I would recommend. I’m not saying stop with Facebook, Instagram, Twitter, YouTube, Medium or any of the prominent social media platforms you use. Keep using social media as part of your branding and marketing but be aware that these media companies of today can simply change their algorithms – or even shut down altogether. You really have no control over them. Once you have complete control over your website and your own subscribers and have a solid foundation on these, you can then focus on building your business brand without the fear of any social media platform disappearing or changing. Design is at the heart of any successful brand or platform. When compared to other competitors, having a good brand design makes a product or service unique and resonates with your customer. So be sure you prepare and invest more time and money in your brand design. Like a luxury car, if you take good care of it, then it will only improve and increase in value over time. This entry was posted in Branding and tagged Bad logo design, brand guidelines, branding mistakes, crowdsourcing logo design.